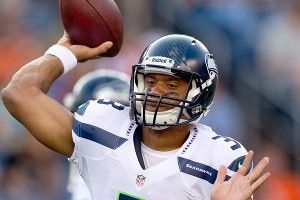 The Seahawks announced on Tuesday that rookie third-rounder Russell Wilson would start their third preseason game. Wilson’s been very impressive against second- and third-string defenses during the preseason, but it’s certainly a surprise that he appears to have the upper hand on free-agent pickup Matt Flynn for the starting job in Seattle. If Wilson makes it to Week 1 as the starter, he’ll join Andrew Luck, Robert Griffin III, Brandon Weeden, and Ryan Tannehill as one of five rookie quarterbacks starting on the league’s season opener. It’s easy to understand why a team might want to turn to their rookie quarterback from day one. It creates excitement within the fan base, instills confidence in the young guy, and begins the arduous-but-necessary process of getting the rookie the needed reps against first-string NFL pass defenses in meaningful action. For the Colts and Redskins, it was the obvious choice. The Browns were committed to Weeden because he’s already old enough to be a Grantland writer, too, but the decision to anoint Tannehill as the Week 1 starter and the possibility that Wilson will follow are curious and dangerous. If preseason football really doesn’t matter, then why are teams making decisions about their starting quarterbacks based on how they perform during preseason games? You can argue that they also look better in practice, but that’s specious and unlikely; I can’t remember a time where a young quarterback performed poorly in the preseason and was named the starter because he played well in practice. Tannehill and Wilson are winning their respective competitions because they’ve shown up during televised preseason games, which is silly. For decades now, baseball teams have held contests for starting jobs and roster spots in spring training and decided them upon how a player does in a 50-at-bat sample against pitchers who just want to go golf. Doing the same thing for football seems equally absurd. Jerry Jones), and Andy Dalton (the normal one!). Wilson might very well be better than those guys, but the organization brought in Matt Flynn as a free agent; why pass on giving him a chance at the starting job when the games actually count? The performance of those rookie quarterbacks who go straight into the fire tends to be pretty bad. Since 1994, the handful of guys who have done so have been dismal through their first four games, completing 55 percent of their passes, averaging six yards per throw, and offering up twice as many picks as touchdowns. Debuting players who weren’t rookies — players like Philip Rivers and Carson Palmer — have completed 60 percent of their passes, averaged seven yards per attempt, and thrown about 50 percent more touchdowns than picks. Similar statistics hold for veterans starting those same games. Teams using those debuting starters will undoubtedly have to take their lumps on offense. That leaves the question of exposure; is it really wise for a team to stick their young quarterback under center and let him play? Perhaps it is. On the other hand, the decision to play their new guy from the first snap forces a team into an unenviable position. Once you make the decision to start the young guy, barring an injury, you’re stuck with him. It would be naive to ignore the importance of confidence in considering quarterback performance, and no coach worth their salt is going to run the risk of irreparably damaging their quarterback’s confidence by going back and forth between him and his backup during the season. And once you do that, well, you run the risk of getting into a situation like the one the Jaguars experienced with Blaine Gabbert this past season. Like Tannehill, Gabbert was a first-round pick with a big arm who put up middling statistics during his final year in the Big 12. The Jaguars didn’t give him the start in Week 1, but Gabbert had the job by Week 3, and he scuffed his way through an atrocious season that led onlookers to wonder whether it was time to give up on the Mizzou product. Perhaps Gabbert will emerge all the better for it this year, but it seems unlikely. Did starting Gabbert really energize the Jaguars fan base, the way that the Dolphins hope Tannehill will excite theirs? Tannehill will almost certainly struggle mightily at the professional level as a rookie, and if the Dolphins decide that Moore gives them a much better shot at winning and being competitive, what do they do? Will the Seahawks really pass on turning to Flynn, who they gave $10 million in guaranteed money to, if Wilson has a bad game or two in September? And what will that do to Wilson’s confidence? What if Flynn struggles and they have to go back? In virtually every scenario (Luck/RG3 situations aside), it’s always better to start with the rookie on the bench and the veteran in the lineup for a few weeks. The veteran often provides better play, and if he struggles, then you get to give your team a shot in the arm by bringing in the talented young rookie after a few weeks of sitting on the bench and observing. There’s a natural desire from the fan base for the young starter to come in. At the very least, it’s a way to win some brownie points by looking “aggressive” and making a change. Once you bring the rookie in, though, you’re stuck with him. The Dolphins are stuck with Ryan Tannehill, and it’s probably going to cost them their shot at being competitive in 2012. Russell Wilson might end up being the best quarterback on the Seahawks roster, but they’re almost surely better off giving Matt Flynn a chance to fail first.